There’s downtown condos. And then there’s this. A 6,800-square-foot penthouse on two top floors in the Four Seasons hit the market for $13 million. The palatial living space has three bedrooms and five bathrooms, an outdoor hot tub and fire place. Listing agent Stan Kniss with Slate Real Estate Advisors said the penthouse has been on the market for a month. Property records show the penthouse was sold in 2011 for $6.6 million. The current owner is an LLC that public records show traces back to Dan Wolf, who manages real estate for Four Seasons investor Salomon Juan Marcos Villareal. Marcos is the CEO of Mexican apparel company Grupo Denim and developed Beaver Creek’s Ritz-Carlton, according to his LinkedIn profile. Villareal’s name is also on loan documents tied to the LLC that purchased the penthouse. 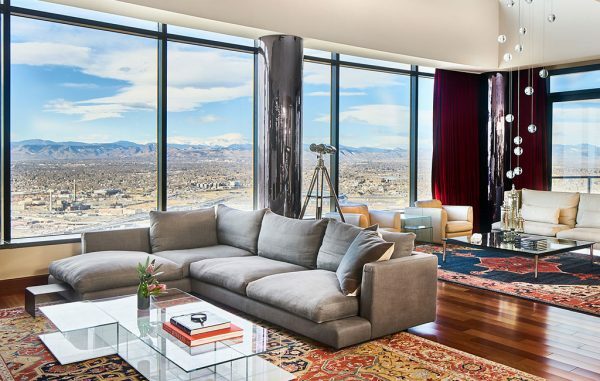 John Carney of Jackson Hole-based Carney, Logan and Burke Architects designed both the penthouse and the entire Four Seasons hotel, which opened in 2010. The penthouse’s amenities include access to the hotel’s house phone, where 300 hotel staff carry out every wish. That room service for the penthouse comes with $6,120 per month in HOA fees. The penthouse has 750 square feet on its two balconies, which include a hot tub, fireplace and built-in heaters.